CVA – 2010-006.062: The back side of B.C Hydro building (today The Elektra residential building). 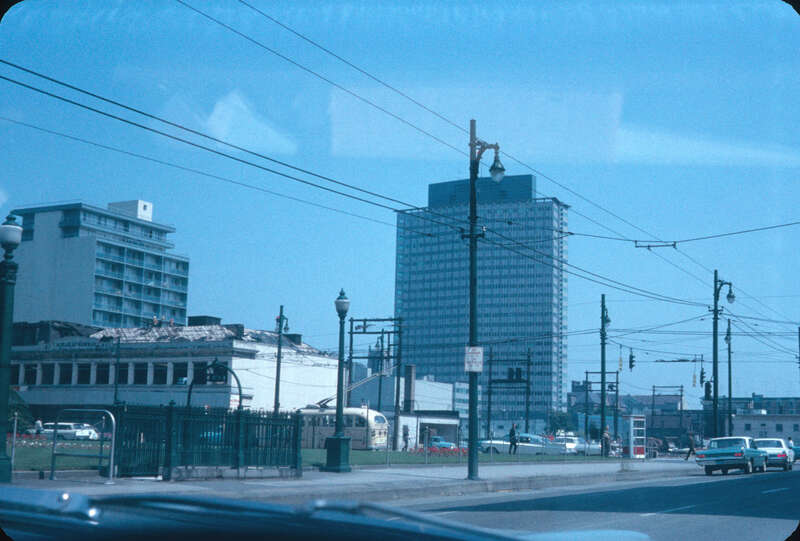 The Clements Block (on south side of Robson between Hornby and Howe) is being demolished in this image. Ernie H. Reksten photo. June 2 1965. Note: This image has been corrected by me flipping it horizontally. 2010-006.062 – CVA’s UNCORRECTED Version. It can be disorienting when a historical image’s negative is printed from the wrong side. By viewing the image to the right, you can see the way the image appears on CVA as of mid-February, 2017. (That the image was wrongly oriented when printed is apparent upon clicking on the uncorrected version of the image and enlarging it to try to read the ‘No Parking/No Stopping’ sign). Let’s take a tour of the correctly oriented image. The photo was taken southbound on Howe Street through the windshield of an automobile. To the right of the car (and outside the photo frame) is the courthouse (1906 Rattenbury; 1912 Hooper – annex)/art gallery. To the right and just ahead of where the car is is some metalwork. That was the above-ground indicator of the courthouse public washroom, which was located underground. The lawn surrounding the couthouse/gallery would later be removed as part of the redevelopment of the block (and replaced with concrete) to make possible the construction of such features as the civic skating rink. The structure that is under demolition in the photo is the Clements Block (1922-65). Clements (SE corner Hornby and Robson) was home to a number of businesses, not least Danceland. Just behind Clements is the hotel that was known at the time this photo was taken as the Johann Strauss Hotel (and restaurant and cabaret). Later the hotel would be known as the Mayfair. The church tower to the right of the BC Hydro (1957; Thom/Pratt)/Elektra block is the tower of St. Andrew’s-Wesley United Church (1933; Twizel & Twizel). 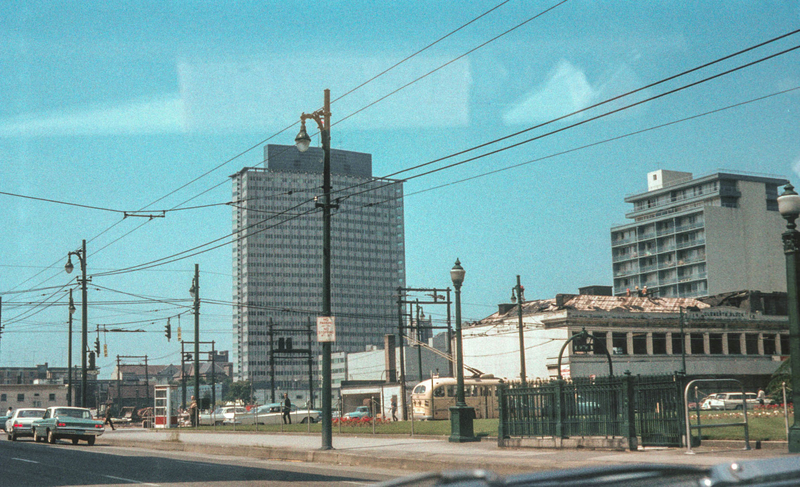 The building to the left of Hydro (now The Elektra) is what was Sir William Dawson School (1913-1978; Edward E. Blackmore), the site today of Sheraton Wall Centre. The other buildings in this image I won’t identify. Suffice to say that the area between Clements and Hydro (Block 61) was made up primarily of ground-level parking lots and would ultimately become the Erickson-designed Law Courts structure. This entry was posted in businesses, cafes/restaurants/eateries, churches, Ernie Reksten, hotels/motels/inns and tagged Arthur Erickson, bc, bc hydro building, block 61, clements block, comfort stations, courthouse, Danceland, Elektra, history, Johann Strauss Hotel, Law Courts Complex, Mayfair Hotel, public washrooms, robson street, Sheraton Wall Centre, Sir William Dawson School, St. Andrew's-Wesley United Church, vancouver. Bookmark the permalink. A good post. As someone on the board of the Friends of the Vancouver Archives, I’m going to bring it to their attention that the image should be properly flipped to show correctly.